The Battle of Boonville took place on June 17, 1861, more than a month before the First Battle of Bull Run, and is considered by many to be the first battle of the American Civil War. In fact, the fighting east of Boonville, Missouri was little more than a skirmish and lasted only about 30 minutes. But this skirmish had a long lasting impact on the struggle for the State of Missouri in 1861. The rapid mobilization by Union Brigadier-General Nathaniel Lyon surprised and defeated the secessionists who had to abandon the Missouri River and flee south towards Arkansas. Except for a brief occupation of Lexington later in the year, Southern forces would never regain control of the State of Missouri for the duration of the Civil War. 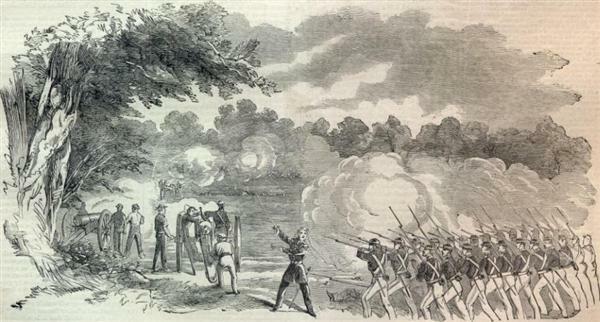 The Battle of Boonville took place on the Rocheport Road a few miles east of Boonville, Missouri 65233. The actual battlefield sites are located on private property and therefore are not accessible. Please respect the property owners and do not trespass on their land. The tour begins at The Battle of Boonville Historical Marker before heading east to the Merna Parking Area for the Overton Bottoms North Unit of the Big Muddy National Fish and Wildlife Refuge. Then the tour follows the approximate route taken by the Federals as they advanced on Boonville. Note: Much of this tour takes place on gravel roads in various states of repair. Be sure to drive carefully. The On-line Tour articles were all written by and the photographs were all taken by theMuse.